These Geisha Girl items are gorgeous! The large bowl has a ruffled edge, measures 7 ¼” diameter, and 1 ¾” tall. The 10 small bowls measure 3” diameter, 1 1/8” tall. 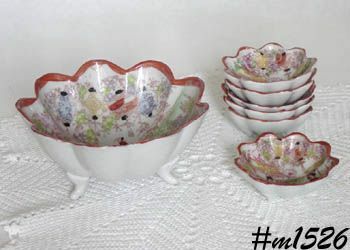 I’m not certain if these bowls originally were a set but they were together when I purchased so I’m listing them together. All bowls are in excellent condition and have lots of gold trim/color accents. Super! The workmanship and attention to detail on this bowl is simply outstanding! Measures 8 5/8” long (to end of each tab type handle), 7 ¼” wide, 2 1/8” tall (not including the wicker covered carry handles). Stamped on back in red “made in Japan”. Excellent condition! 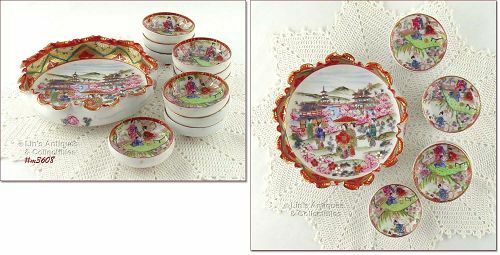 This listing has a beautiful Geisha Girl 7 piece nut bowl set! These bowls have the rust color rim. The set consists of the larger mater nut bowl and 6 individual size bowls. The large bowl measures 2 11/16" tall, 5 3/4" diameter. The small bowls measure 1 3/16" tall, 3" diameter. 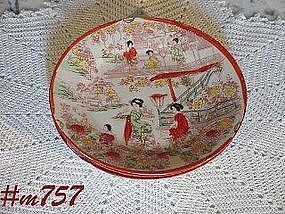 The large bowl has "Made in Japan" on bottom (in rust color), small bowls are unmarked. 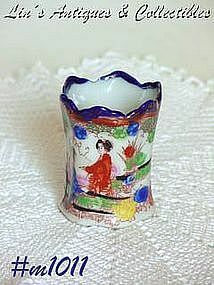 BEAUTIFUL GEISHA GIRL TOOTHPICK HOLDER! THIS IS THE ONLY PIECE FROM MY COLLECTION NOT IN THE RUST/ORANGE COLOR -- THE BLUE WAS SO PRETTY THAT I COULDN'T RESIST PURCHASING IT! VERY DECORATIVE, HAS GOLD ACCENTS ON THE BLUE RIM AND THE HOLDER HAS AN EXTRAORDINARY AMOUNT OF DETAIL COLORING! NOT MARKED. EXCELLENT CONDITION. 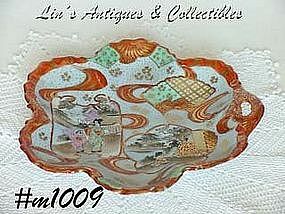 ABSOLUTELY BEAUTIFUL GEISHA GIRL DISH! 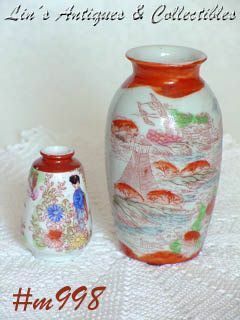 IT HAS 2 RESERVE PATTERNS, ONE IS MOTHER AND SON, THE OTHER IS SON WITH SAMURAI. THE EDGE IS SCALLOPED, RUST/ORANGE COLOR WITH LOTS OF GOLD TRIM. BOWL ALSO HAS LOTS OF GOLD. HAS JAPAN MARKING ON BACK. OUTSTANDING! 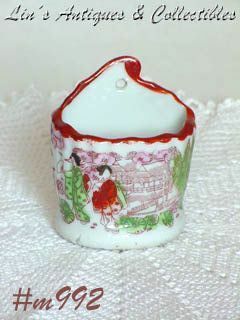 This listing has two Geisha Girl bud vases -- one is 4 1/2" tall, the other is a mini at 2 1/2" tall. Both are in excellent condition and are from my collection. 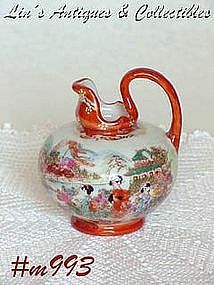 VERY FANCY GEISHA GIRL CREAMER! BEAUTIFUL COLOR AND DETAIL, RUST COLOR, VERY DECORATIVE GOLD ACCENTS. EXCELLENT CONDITION! 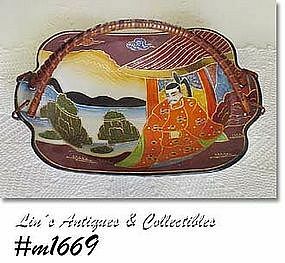 This listing has a beautiful Geisha Girl match holder! It has a hole for hanging and it is also free standing. Although it really is a match holder, I think it's perfect to hold your rings while washing dishes or bathing! Match holder is in excellent condition with no evidence of "use". It does have a production 1/4" line at bottom that has color and glaze -- definitely production, not from use. THESE GEISHA GIRL SAUCERS ARE BEAUTIFUL! THERE ARE 3 BUTTERFLIES AND 5 GEISHAS ON EACH SAUCER. THE RIMS ARE SCALLOPED AND ALL HAVE THE RUST COLOR EDGE WITH YELLOW DOTS. EXCELLENT CONDITION. WOULD MAKE A BEAUTIFUL AND STRIKING WALL DISPLAY. 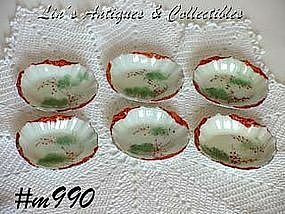 THESE ARE UNUSUAL ITEMS -- 6 BUTTER PATS AND THEY ARE BEAUTIFULLY DESIGNED. 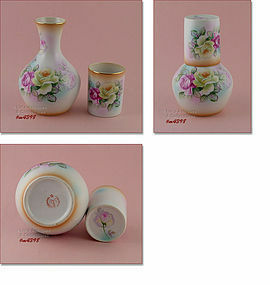 THEY DO NOT HAVE A GEISHA, THE DESIGN IS OF A COUPLE GREEN BUSHES WITH RUST COLOR TWIGS AND BUDS. THE SIDES ARE FLUTED -- NOT PLAIN -- THE RIM IS ALSO FLUTED/SCALLOPED. THE EDGE HAS THE RUST COLOR IN PLACES AND GOLD IN OTHERS. EXCELLENT CONDITION -- HAVE BEEN IN MY COLLECTION 10+ YEARS. 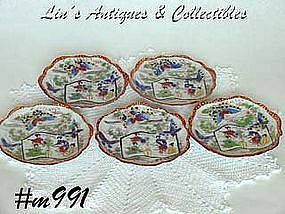 FROM MY COLLECTION, THIS LISTING HAS 3 GEISHA GIRL SANDWICH/DESSERT PLATES. THEY MEASURE 7 1/8" DIAMETER AND ARE ALL SAME PATTERN -- WOULD MAKE A STRIKING WALL DISPLAY. EXCELLENT CONDITION WITH NO CHIPS OR CRACKS!